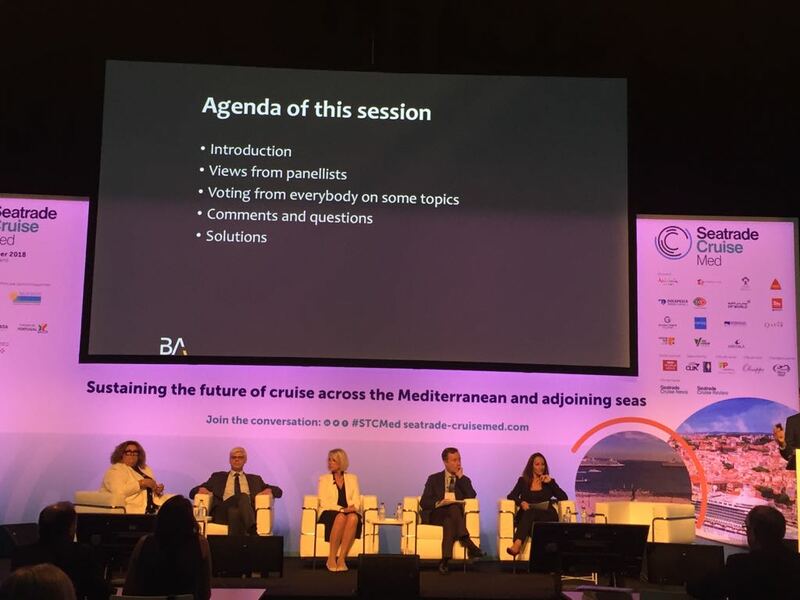 During the course of the round table organised at the 2018 Sea Trade Cruise Med fair in Lisbon, the President of the Port Authority of the Balearic Islands (APB), Joan Gual de Torrella, has backed specialist services by each of the agents who intervene in the cruise tourism sector. In this way, Gual explained that the APB offers a service to shipping companies, and the destination area is responsible for creating and providing a complementary tourist service. This additional service, therefore, should be characterised by each location and the shipping companies should be able to adapt to each one. “Palma has gone from being the capital of a tourist destination to being a tourist capital”. That’s how Gual summarised the growth of the capital of Mallorca, which now provides highly specialised commerce and accommodation for its visitors, with boutique hotels and luxury shops. The president of the APB stressed that 40 years ago, the members of the Balearics, Chambers of Commerce, local councils and Parliament pinpointed the development of cruise tourism as an area of growth and urged the APB to invest in infrastructure to make this possible. Therefore, little by little, this tourism sector has grown, culminating in the last five years with the Balearic Islands positioned as the second most popular cruise destination in Spain, and the fourth in the Mediterranean. Gual highlighted that the APB has fulfilled its investment cycle, with the development of construction projects and renovation of the port infrastructure, together with national and international promotion campaigns. They have also taken on studies and support for this tourist product, even leading tasks which fall outside of their field of knowledge and skills expertise, as they have more to do with managing tourist infrastructure on land. “Now, it is necessary for each party to contribute its best skills and abilities. The group of public and private entities specialised in tourism must define and undertake a common strategy, using all the additional services the ports can provide”, stated the President of the APB. highest quality, while at the same time taking care of the environment by working together with companies to minimise and correct any effects on it”. 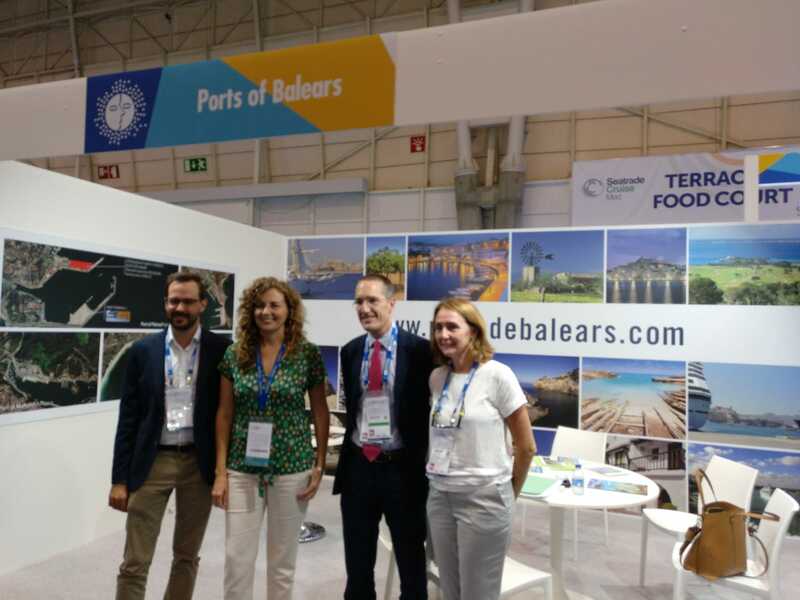 The main aim of the APB’s presence at this Sea Trade Cruise fair in Lisbon has been to promote the port of Mahon as a high-end, exclusive destination, in order to attract the medium cruise ship sector which fits the tourist services Menorca can provide. The delegation from the Balearic Islands which attended the Seatrade fair; made up of Héctor Pons, representing the Mahon local council, Jorge Nasarre, APB Head of Planning and Sustainability and Xisca Leal, APB Sales; also welcomed María Ornella Chacón, President of the State Ports, at their Balearic Ports stand.